"Any fan of mine who's a supporter of his, I'm drawing in the sand a line." 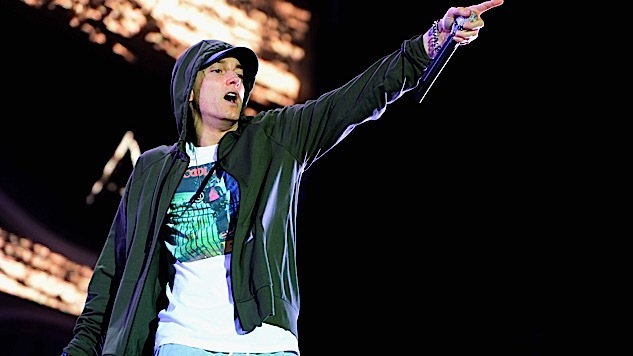 Eminem made an appearance at last night’s BET Awards, performing a prerecorded freestyle as part of the show’s Cypher Series that was entirely devoted to slamming Donald Trump. Dressed in black and stalking around a parking garage, a clearly angry Eminem calls the president a “kamikaze that’ll probably cause a nuclear holocaust.” He also slams him for, among other things, distracting the nation with tweet storms about the NFL instead of focusing on hurricane relief or gun violence, disrespecting the military, and generally being orange. “Yeah, sick tan,” he says. Shortly after the performance, artists and athletes, including LeBron James, T Pain and J. Cole, began posting their appreciation some of their favorite lines from the rap. LeBron James highlighted Eminem’s “Fantastic Four” reference.